Oh my goodness, what a delightful time this past week has been! Friday the kids woke up chomping on the excitement in the air. The morning was a flurry of costumes and hair fixing and chatter. 'Hurry!' they seemed to whisper with every motion of their bodies. Of course, we had to pause outside the door for pictures. Keith was the Doctor. The 10th Doctor, to be precise. Faye chose to be Alice in Wonderland, and I think she was the most darling Alice ever! Beth, of course wanted to join the picture. She was still in her pajamas and wearing her jacket. She always insists on wearing the hood to whatever jacket or coat she has on, and as I looked at the picture later, I had to laugh. She could have been in costume as the Unabomber. I got to help in Faye's class. It was so much fun! Before her class, though, there was a costume parade. I found a seat in the gym, and waited for the parade to begin. Michael Jackson's Thriller came on over the loudspeaker, and those adorable little kindergartners strutted in, excitedly, timidly, proudly showing off their costumes. As they ambled into the room, like a line of confused ants, tears sprang to my eyes and a knot to my throat. There was just too much cuteness in the room for this pregnant lady to handle. I tried to discreetly wipe away my tears, but oh my goodness, the room was oozing with charming little goblins, monsters and princesses! Happily, I was able to get my erratic emotions under control just when Faye came by. And her sweet happy smile nearly did me in! It will be nice to no longer be controlled by weird random bursts of crying for no apparent reason. By the time Keith came through, I was able to just smile and wave, and no tears came, although I would be lying if I said they didn't threaten. After the kids had gone through, it was time to get helping with the class party. I had brought some brooms and witch hats for an obstacle race for the kids. They came to me in groups of 4-5 and it was so much fun watching how they tried to maneuver those big brooms. We then played "Pumpkin, Pumpkin, Ghost" until it was time for them to move on to the next section. I am so glad I was able to help out and look forward to the next time I am needed in her class. The rest of the day was crazy busy. I met my sister in law for lunch and the kids ran around playing while we visited. We got home from that and Jeffrey was home. His mother had just had surgery on her foot, so we went to visit her. We made some dinner for them, and then we went home and to bed. Because Saturday was the important day, anyway. We all got up, just brimming with anticipation. The kids kept asking when it was time to go trick or treating? I had a few errands to run, and the girls came with me. Now, I had been stewing over what I could be for Halloween. 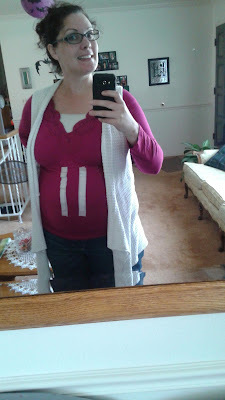 I had already been Hester Pryne (from The Scarlet Letter) when I was pregnant with Faye, which I thought was hilarious. This would probably be my last chance to use my pregnancy in a costume, and so I needed to make it good. Nothing was coming to me. It was the afternoon of Halloween, and I was stumped. I finally decided on just going as a life size Barbie, which would mean that Faye would fix my hair, makeup, and pick out my clothes. But, as I was driving home from the store, I had a stroke of brilliance. A pregnant pause! I could be a pregnant pause! It is punny, and clever, and oh my goodness, how sly would that be? And so, in that one moment, it was decided. I was going to go as a Pregnant pause. Finally, around 3 we began the preparations with our costumes. I had to grin the whole time. Those children of mine sure are wonderful! They were helpful with each other's costumes, and we got out the door in no time at all. 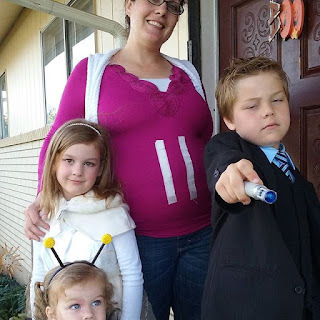 We stopped by Adrienne's house to pick up Keith's sonic screwdriver which he had accidentally left there. We then stopped by my mom's house, our friends Gary and Felina because I had some stuff to give to Felina. Then my grandma's house, and Jeffrey's parent's house. We had left by 4. We were only at each house for 10-15 minutes, but somehow, those four visits took up 2 hours! 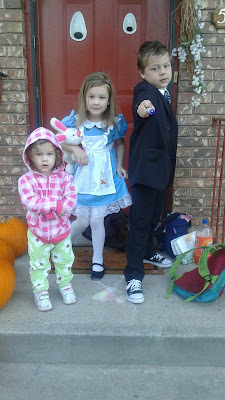 Our friends that we were Trick or Treating with were at the house before we got home! We rushed home, I ate some pumpkin chili so I could survive the excitement of the night without getting sick, and we left! And it was so fun, and they were adorable, and cute, and I just love them to pieces, and I wish we could repeat Halloween night a few times more during the year because gosh, it is so much fun! Unfortunately, we had to cut our trick or treating short. I was getting sick and began dry heaving on the side of the road, so we just rushed back home and I had some more chili. The Nerds arrived shortly after that, and we chatted for a bit. Kylie, her twin Kelsie, Andrea and I decided to go ghost hunting. Apparently there is a pond near my house where the children and I like to play, that is said to be one of the most haunted places in Utah. Of course we had to check it out! The boys stayed behind with the kids and we headed out, and oh my goodness, it was beautiful! The way the stars, the clouds, the moon reflected in the water was breathtaking. The shadow of the trees looked like lace hanging down, and what a lovely evening it was! After the pond, we decided to go to a cemetery in a neighboring city. One that I had heard all growing up to stay away from after dark because there were lots of murders there, and it was haunted. So of course, we had to go there! Alas, it was barricaded off and there were police cars inside, deterring any ghost hunting. While waiting at a red light, though, a car full of teenage boys pulled up alongside us and tried flirting with us. They wanted us to roll down the windows, race them, etc. It was very funny and quite flattering. Of course they couldn't see my costume, otherwise I am sure there would have been a very different outcome there. We went to one more cemetery. This one I know well. I used to walk around it a lot with Keith when he was a baby. I love it there, and told them a few ghost stories that I had learned from the groundskeeper I had become friends with. We drove around a bit, and the weirdest thing happened. I got hit on the head. Not by anyone in the car, but I distinctly felt something hit the top of my head. Had I not been in a car with a roof over my head, I would have assumed a pine cone or acorn had fallen on me, but no one in the car had touched me, and there was a roof over my head, so I just can't explain it, other than it was a bit creepy. Just when we decided to leave the cemetery, we turned a bend, and saw... something. No idea what it was. In actuality, it was probably a reflection on the window, or something like that, which my brain translated into being a white translucent teenage girl, floating above the ground a bit. Needless to say, we left the cemetery immediately. The rest of the night we joked about the ghost girl, though. It was a lot of fun, and I hope I get to do the same thing next year as well! We got home, joined up with the guys and I fell asleep while they all watched a 1950's horror flick called Them! which is about giant man eating ants. I was so happy when Sunday rolled around. A day of rest. The best day! I had decided we would not be late for church. There really is no excuse for us being late. Church starts at 1. I began my preparations by throwing a roast into the crockpot. I got the kids ready, and I was getting myself ready when I had to stop. Pain in my lower back. But weird pain. Pressure pain. I figured they were Braxton-Hicks. So, I stopped my process of preparation for church and pulled out good ol' Doctor Google. Everything I read said if I felt pain in my lower back, where there hadn't been pain before, I needed to contact my doctor. I sighed, waited through another pain surge (they were coming about every 2 minutes, in waves, and lasting for about 30 seconds), and then texted my midwife. She said it sounded like preterm labor. She advised me to lay down, drink 2 glasses of water, and see if they will go away. I asked her if I could do my sitting down at church, but she advised against it, saying I really should be laying on my side. This was really difficult for me to hear. I had missed church last week as well, because I had been sick and spent the whole day in the bathroom. I didn't want to miss another week! But more than that, I didn't want anything to go wrong with the baby. I have never had any sort of preterm labor before, though, so I did exactly what my midwife advised. I sent my family off to church without me, and I laid down and took a nap. I feel bad that I have only actually been there once since I was released. It probably appears that I am ditching church because I am unhappy with not being in primary any longer. But that is not the case at all, I keep having these ridiculous things happen to me, right before we are heading out the door for church! Oh, and I did get a new calling. I am the mid-week activities coordinator for Relief Society. I am very excited for this calling. It is the same calling I had before we moved into this ward, and I had to laugh. Apparently I can only do two things. Play with children, or plan activities. But I am so happy for this opportunity. I am sure I will have a lot of fun with it. I was really sad, though, because I missed my first meeting with the other sisters on the committee yesterday. Happily, the preterm labor has gone away, and I am going to just take it easy for a bit, to see if that will help it not come back. What a weekend! I honestly am not sure how we survived so much going on! I am happy to try to get back to my regular schedule, though. Happy Monday! What an awesome weekend! I love your costumes! I can't believe I missed the Haunted pond. How fun!!! You'll have to let me know where that one is so I can check it out. I thought your pregnant pause was clever.